I watched Christina Aguilera's new video Keeps Gettin' Better this morning and out of all the characters she channels my favorite would have to be the stripperella-ish Catwoman. 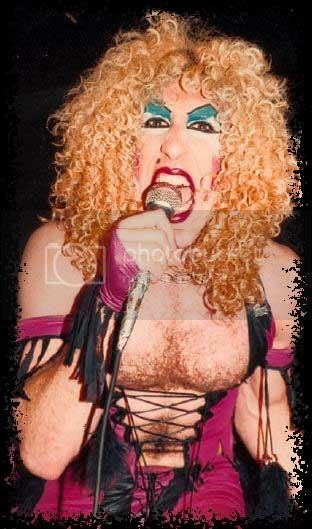 That look revisits her ode to Twisted Sister's Dee Snyder from the Lady Marmalade video. Well done I say! The inspiration for my illustration came right at 2:27 in the video. Have a look. 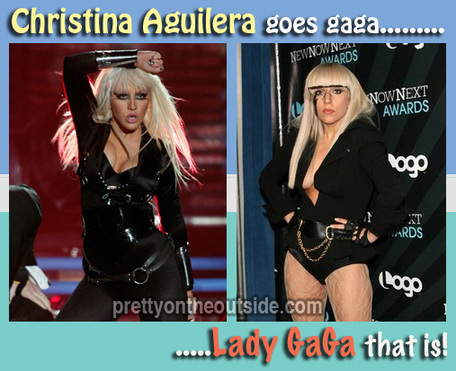 Will the real Christina Aguilera please stand up? Please stand up! I'm going to start by saying I know this is 100% silly fluff not from concentrate. That said, on with the posting. I'm only aware of the mystical singing goddess known as Lady Gaga because of my BFF. He's always up on the latest dance music and a few months ago played me her song Just Dance. Catchy. I had no idea what she looked like until her star turning performance on So You Think You Can Dance. Christina Aguilera. Pregnant Pop Star. 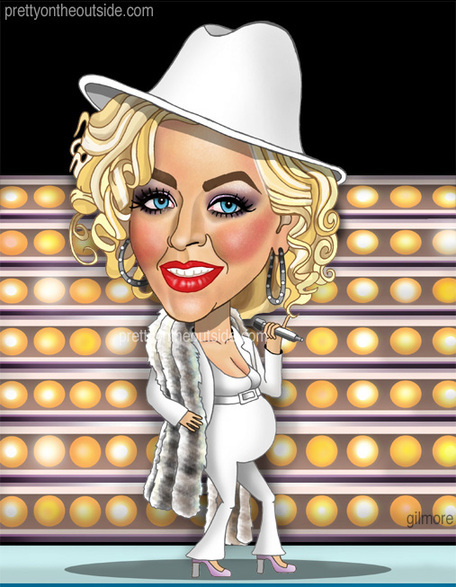 "I want everyone to say congratulations to the most beautiful pregnant woman in the world, Christina Aguilera. You're gorgeous!" That was spoken by the not talented singer Paris Hilton about the very talented and very pregnant Christina Aguilera when the heiress grabbed the mic at LAX Night Club in Las Vegas. Nice comment but Christina has never publicly announced her pregnancy. Oopsy! Maybe Paris should stay away from microphones?